This 60-acre park next to The Citadel in downtown Charleston is encircled by Mary Murray Drive, a two-lane road which follows the historic Washington Race Track. The former racecourse was established in 1792 by the South Carolina Jockey Club, whose elite members included General Charles Cotesworth Pinckney, delegate to the Constitutional Convention of 1787; General William Moultrie, South Carolina governor and Revolutionary War hero; and Wade Hampton, governor during Reconstruction, United States senator, and namesake of this park. Race week was held in February, giving wealthy thoroughbred owners an opportunity to demonstrate their horses’ speed and skills around the one-mile track. During the Civil War, Washington Race Track became the site of a Union prison camp where 250 Union soldiers died. For two weeks in April, enslaved people buried the deceased soldiers behind the bandstand (seen below). On May 1, 1865, 10,000 former slaves marched onto the grounds of the race track for a celebration honoring the lives of the Union soldiers who had passed. 2,800 black school children marched by the graves, singing “John Brown’s Body” which was followed by prayer, sermons, and picnics — the former slaves called this day, Decoration Day. This tradition is believed to be the start of the first Memorial Day. In 1899 the club voted to disband, and the property was deeded to the Charleston Library Society. The Library Society then leased the land to the South Carolina Inter-State and West Indian Exposition, a business fair held on 250 acres of surrounding property from December 1, 1901 through May 31, 1902. The purpose of the expo was to showcase Charleston in hopes of luring new industries to the city. 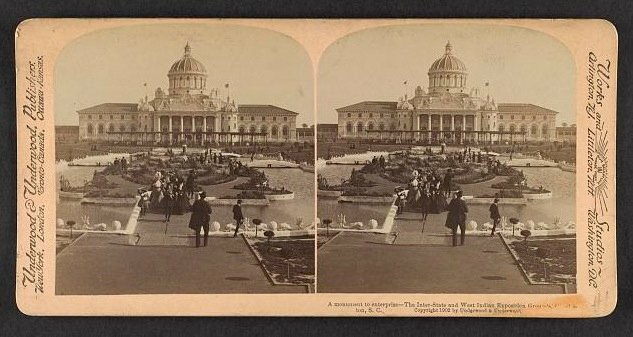 As was typical of late nineteenth and early twentieth-century world fairs, several buildings were erected specifically for the event, including the ornate Court of Palaces, seen above, and the renowned sunken garden. President Theodore Roosevelt attended the event in April of 1902. 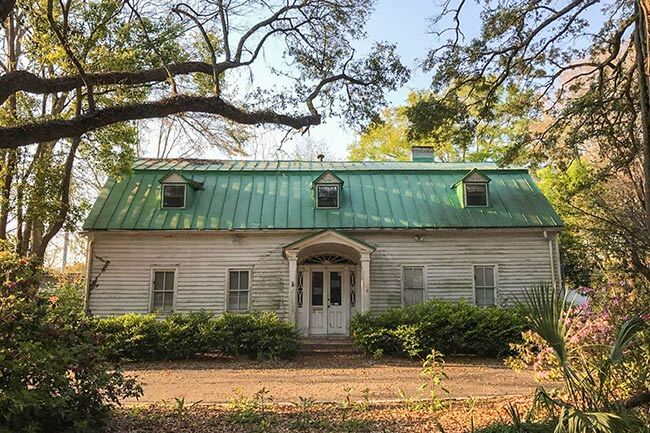 Though the South Carolina Inter-State and West Indian Exposition was not widely viewed as an economic success, the American Cigar Company, the United Fruit Company, and an oyster canning company established businesses in Charleston as a result of the fair. When the City of Charleston sold Chicora Park in North Charleston to the Navy Yard in 1901, it used the proceeds to purchase the former race course following the close of the expo. 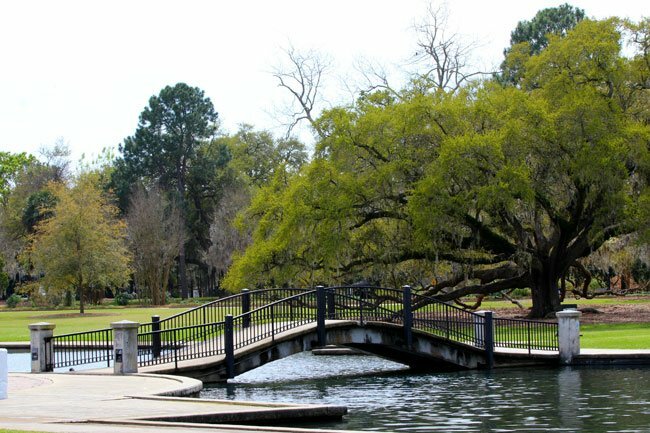 The city then established Hampton Park, a popular green space with paved and unpaved trails, historic plantings, and a variety of majestic native trees. Both Chicora Park and Hampton Park were designed by the John Charles Olmsted and Frederick Law Olmsted, Jr., sons of Frederick Law Olmsted. The elder Frederick Law Olmsted was the landscape architect famous for designing such landmarks as Central Park in New York. The nearly domed bandstand, pictured above, was relocated within the park from its original site at the expo and is the only remaining building from the fair. 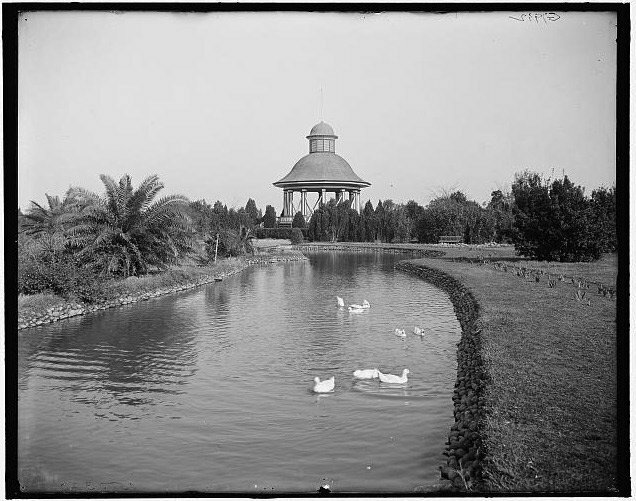 The sunken garden also remains within the park as a beautifully landscaped lake. 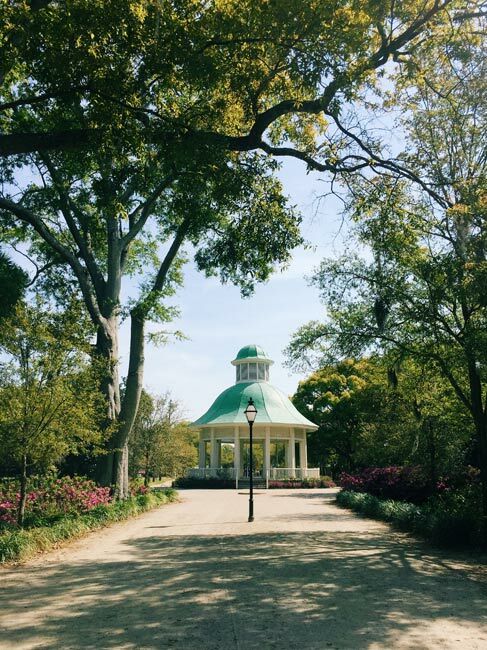 The park is closed to traffic, creating a safe haven for walkers, runners, and cyclists to enjoy the outdoor beauty of Charleston. Hampton Park also offers a fitness trail, frequented by neighboring Citadel cadets, as well as the Spring/Summer/Winter Walk, Run, or Roll held on Saturday mornings from 8 AM until noon and Tuesdays and Thursdays from 6-8 PM.